Clean Sweep, Bates College’s seventh annual “garage sale” of electronics, furnishings, bikes, toys and other goods donated by departing students, takes place from 8 a.m. to 5 p.m. Saturday, June 16, at the college’s Underhill Arena, 145 Russell St. Please note that some published reports listed the wrong date for the event. Saturday, June 16, is correct. Proceeds from the sale benefit local nonprofit organizations. The sale is open to the public. Members of the public are also invited to donate items and/or volunteer to staff the event. To learn more, please call Bates environmental coordinator Julie Rosenbach at 207-786-8367 (office) or 207-240-4626 (cell). 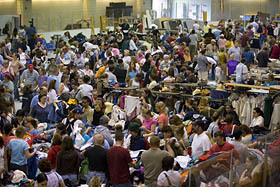 Bates is one of a number of colleges and universities nationwide that benefit both the environment and their communities by selling usable goods — clothing, electronics, furniture, appliances, athletic and outdoor equipment and myriad other items — donated by students as they head out at the end of the academic year. 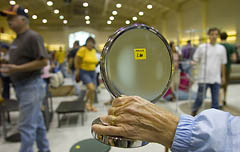 Organizations that benefit from the sale’s proceeds provide volunteers to staff the event. Last year’s event raised more than $9,500 in proceeds that were divided among nine local nonprofit organizations and a school athletics program. Beneficiaries included the Maine Fair Trade Campaign, Androscoggin Head Start, the Maine People’s Alliance, the Lewiston High School track and field program, Nana’s Dream Museum of Miniatures, Common Ties, the Caleb Community Garden, the Share Center, New Beginnings and the Justice, Ecology and Democracy Collective. More than 100 volunteers from those organizations helped staff the 2006 event. An estimated 88 percent of the goods on offer were sold, 11 percent were donated to charitable organizations and a mere 1 percent entered the waste stream.